23 April launched under the name HMS PROVIDENCE. After she was launched she was moved to Woolwich for bottom coppering. For her guns she moved to Longreach and was armed with 12 guns, and 14 swivels. After ballasting at Sheerness on 08 July she sailed to Spithead. She was bought by the Navy for Captain Bligh second expedition to Tahiti to collect breadfruit trees, after he returned to the U.K. after the mutiny of the HMS BOUNTY. 03 August 1791 she departed together with the brig ASSISTANT which was under command of Lieutenant Nathaniel Portlock. 27 August they sighted Tenerife, and anchored off Santa Cruz the next day for firewood and fresh water. 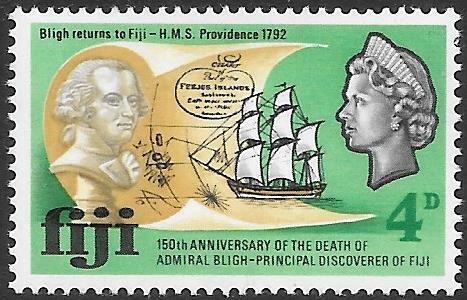 30 August, Bligh got sick and was confined to his cabin. Command taken over by Portlock the next day. 01 September both vessels sailed from Tenerife. 10 September she arrived at Porto Praya, Cape Verde Islands, the PROVIDENCE lost her bower anchor, and finding out that there was much sickness on shore and not any provision she sailed the next day. 15 September Bligh recovered from his illness but on the 18 September he got worse again. 03 October both vessels cross the Equator. 07 November arrived at Cape Town, for firewood, fresh water and repairs; Bligh left the vessel and goes inland to Stellenbosch to recuperate. Bligh took over command of the PROVIDENCE, and Portlock back to the ASSISTANT. 23 December both ships sailed from Cape Town. 18 January 1792 St Pauls Rock and Amsterdam Island sighted. 30 January both ships were in a position of the sw tip of West Australia. 08 February van Diemen’s Land was sighted and on 09 February both vessels anchor in Adventure Bay, Bruni Island, van Diemens Land (Tasmania) for firewood, fresh water, collecting of plants and repair and maintenance. 24 February set sail, Bligh again ill with muscle spasm and headache. 05 April Tematangi sighted and charted. 08 April Maitea, south east of Tahiti in sight. 09 March, noon time, both vessels anchor in Matavai Bay, Tahiti. 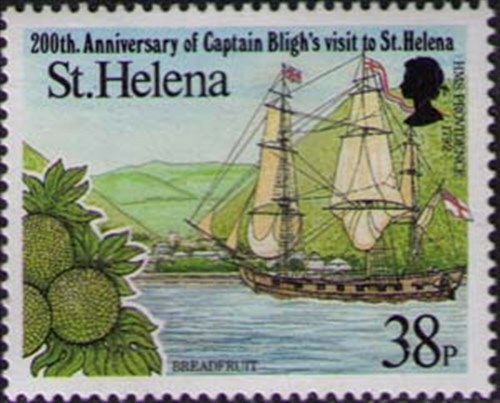 After they collected breadfruit plants, the plants were brought on board on 14 July, Bligh still ill.
16 July the last plants arrived on board. 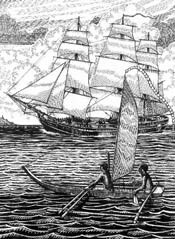 19 July both ships sailed out, 20 July she passed Moorea and Huahine. 25 July the ASSISTANT sighted Aitutaki and spoke with a native canoe. From 03 August to 06 September many islands sighted, and both vessels passed safely the Torres Strait and arrived off Kupang, Timor on 02 October. After taken on board water firewood and provision both vessels sailed out from this port on 10 October. Sailing via Java and heading to Cape of Good Hope. 18 December, arrived St Helena and taking in wood and water. 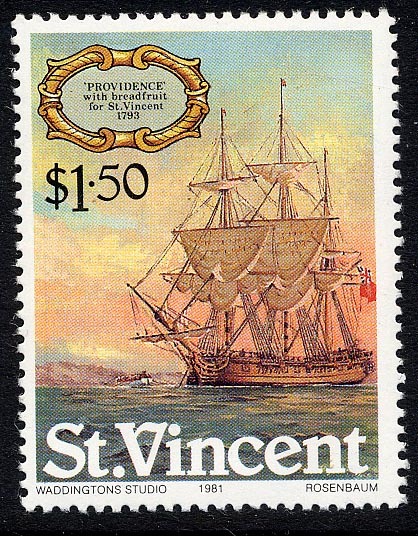 27 December sailed from St Helena, crossed the equator on 09 January and arrived Kingston, St Vincent on 23 January 1793. The next day the breadfruit plants were discharged and wood and fresh water taken on board, sailed on 30 January bound for Jamaica, where they arrived on 05 February at Port Royal. 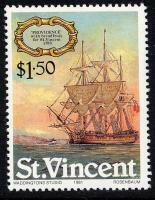 PROVIDENCE sailed for Port Morant and the ASSISTANT to Savannah la Mar. She arrived 16 February at Port Morant and sailed on 04 March from that port for Port Royal. 28-29 May, breadplants back on board from the nursery. 03 June Sailed from Port Royal and arrived Bluefields 04 June. 15 June in convoy she sailed from this port and arrived Georgetown, Grand Cayman on 18 June. 19 June sailed in convoy for England. 30 July the Scilly sighted. The same day Lands End. 02 Augustus arrived in The Downs and anchored.03 August arrived at Tilbury. It looks that Bligh was not well most part of the voyage. After arrival the PROVIDENCE was refitted in a research vessel for a voyage to the join the Vancouver survey party on the North West coast of America, and instructions for an exploration of the East Asian coast. 03 October 1793 command of the PROVIDENCE was given to Commander William Rober Broughton. Early 1795 the PROVIDENCE sailed from Plymouth in convoy to the Mediterranean, after leaving the convoy she headed for Tenerife and sailed from there in March, and via Cape Horn she reached Tahiti on 28 November 1795, sailed from Tahiti 11 December. Arrived Hawaii 01 January 1796 and sailed on 20 February. From there he sailed to Nootka Sound to rendezvous with Vancouver. When the PROVIDENCE arrived there in June 1796 Vancouver had already left and the PROVIDENCE sailed across the Pacific to Japan. 07 September she sighted their first Japanese Island supposed to be Nambu about 4 to 5 leagues from the north shore of Japan. She sailed down the coast of Japan, taken soundings and charting the coastline, did have some encounters with the local Ainu people living along the coast. 28 September she sailed from Japan in a southerly direction along the coast of Honshu, which till that time was not well charted. Due to bad weather he could not enter Yeddo Bay and headed for Macao, where she arrived 13 December 1796. After refitting the vessel at Macao and taken on board fresh provision water and wood they sailed out again to continuation the survey voyage, arrived on 19 April 1797 at Poo-tory, Formosa (Taiwan). He charted the coast and observed the people living along the coast. But on the evening of 16 May she struck a reef along the coast near Liu-Kiu Island, and was lost. All crew was rescued and taken on board the RESOLUTION. Wrecked near Ty-pin-san, an island between Formosa and Great Loo-choo, because Lieut. Vashon did not keep a proper lookout. The officers and the crew escaped in the ships cutter, and during their voyage to Macao many died from diseases bought on by overcrowding. The survivors (except one who embarked on a merchantman )after arrival in Macao embarked on the sloop SWIFT which escorted a convoy of merchantmen bound for England. The convoy was overtaken by a succession of violent typhoons in the China Sea. The convoy scattered and many ships were disabled. The SWIFT was last seen making signals of distress, and is presumed to have foundered in the typhoon. And other web-sites. Log Book. 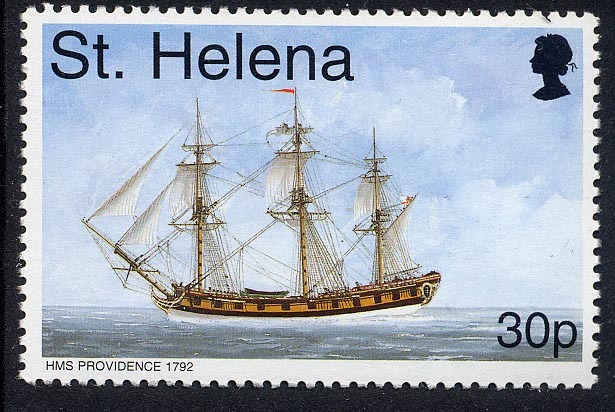 St Helena 1992 38p sg 623, scott 586.